Wakulla Linerlock. 4.38" closed. 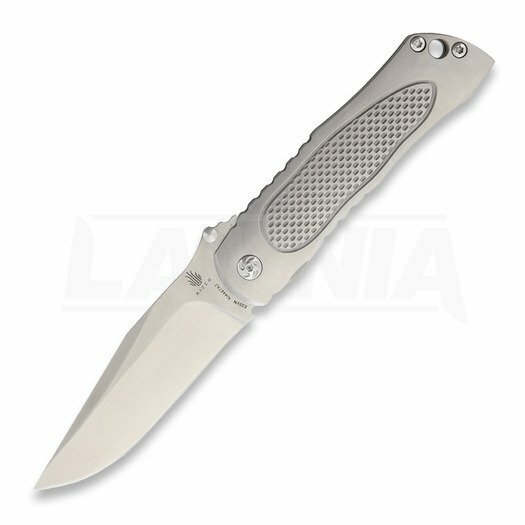 3.5" satin finish CPM S35VN stainless blade. Satin finish titanium handle. Lanyard hole. Pocket clip. Thumb stud. Camo nylon zippered storage case. Lamnia offers FREE shipping on orders over $120.00! No matter the size or weight of the parcel, no additional shipping costs will be added at the checkout if the value of your order is over $120.00. We will pack and ship your order as soon as possible, usually within 1-2 business days. Do not hesitate to contact our customer service via live chat, our contact form or e-mail! We try to do our best and answer all requests within a few hours during our working days! Our entire webshop is encrypted with 256-bit SSL protection. When you move to the payment pages, our partners PayPal and Nets will make sure your payment transaction is completely secure! It's ok to change your mind! You may return the unused item in its original packaging within 14 days. You may change the product or receive a refund. A refund of the merchandise, shipping to you and taxes (if applicable) will be given, however, shipping and handling back to us will not be refunded. It's ok to change your mind! You may return the unused item in its original packaging within 14 days. You may change the product or receive a refund. A refund of the merchandise, shipping to you and taxes (if applicable) will be given; however, shipping and handling back to us will not be refunded. * We charge you in Euro. Your bank will make a currency conversion, using one's own exchange rate. The final amount you pay might be different from the estimate shown above.